Needless to say, a visit to the Art Institute of Chicago should not be taken lightly, you could spending days wandering these halls. 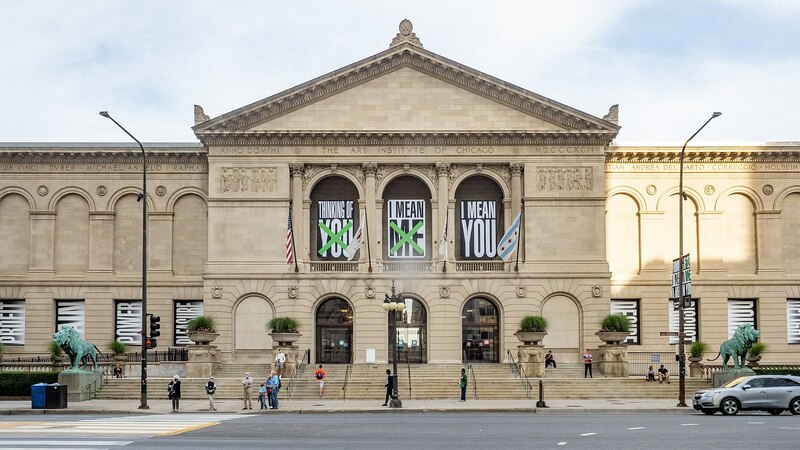 In 2014, the Art Institute was rated the #1 museum in the world by Travelers Choice. Considering how many museums there are on this wee planet, I would say that is a pretty hefty accomplishment. Not surprisingly, it is also one of them most highly visited museums in the world with an average of 1.5 million visitors a year. It is also the second largest museum in the country after the Metropolitan Museum of Art. In 1866, a group of wealthy philanthropists decided to create this museum and school to help bring some artistic culture to the then gritty industrial city of Chicago. The School of the Art Institute of Chicago began offering classes in 1868 for a whooping price of $10 a month. Nowadays this place will cost you an arm and a leg to get into one of their courses, but is still likely worth the investment. Afterall, that's where Kanye West got his honorary doctorate. The Institute made it a whole five years before they found themselves $10,000 in debt. Not that they are wholly to blame, the Great Chicago Fire destroyed the building in 1871, which was most definitely the culprit that threw this organization so far in debt. Worry not, for they pulled themselves back together and managed to amass a collection that is simply stunning. Amongst their 260,000 item collection, this museum owns some of the most iconic pieces in the art history such as American Gothic, Nighthawks, and The Old Guitarist. Needless to say, this museum is bound to excite the most novice art goer with its infamous work. While their paintings are what the institute is commonly praised for, other genres of artistic expression are well accounted for here, including furniture by Frank Lloyd Wright. They also have one of the largest impressionist and post-impressionist art collections outside of France. Two epic lion statues created by artist Edward Kemeys guard the western entrance of the museum. These beasts have been unofficially named “stands in the attitude of defiance” and “on the prowl.” It is tradition that when a Chicago based sports teams play a championship game that the lions be dressed up in the respective team swag to show their support. The young hooligans in the hit movies Ferris Buller’s Day Off visited the art institute while gallivanting through Chicago. If it’s worth ditching school to see, it must be good. The second largest museum in the United States after New York's Metropolitan Museum of Art. The original building was destroyed in the Great Chicago Fire started, of course, by Old Mother Leary's cow. The two bronze lions at the western entrance were unofficially named by the artist as 'stands in an attitude of defiance' and 'on the prowl.' They are often dressed up to support whatever Chicago sports team is playing a championship game. Check out the full Wikipedia article about Art Institute of Chicago.